LA teachers, supporters march into LAUSD headquarters | Fight Back! 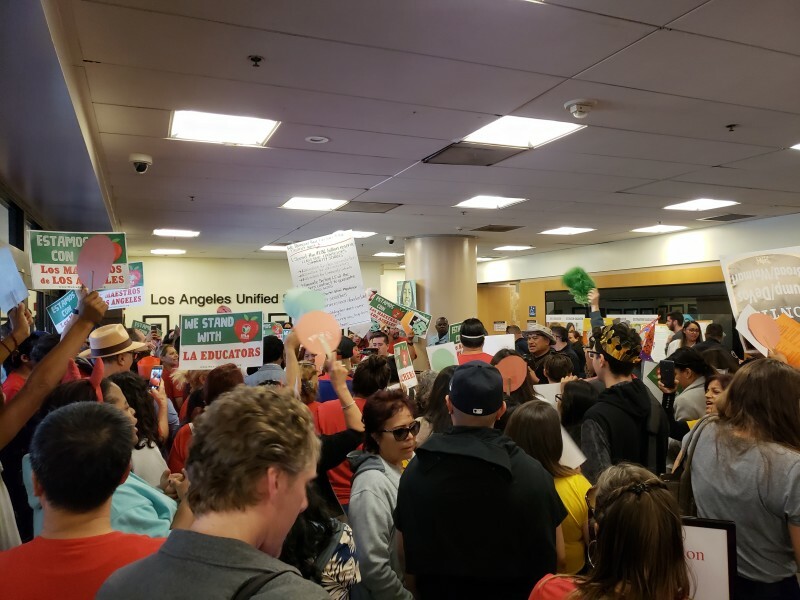 Los Angeles, CA - Over 300 militant parents and students, along with teachers who are members of United Teachers Los Angeles (UTLA), gathered at LA Unified School District (LAUSD) headquarters, October 23, to protest Superintendent Austin Beutner. 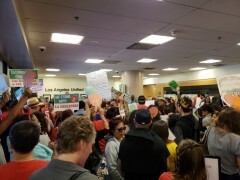 Near the end of the rally, they all marched into the LAUSD superintendent’s office and staged an occupation, demanding to meet with Beutner. Beutner was former CEO of the Los Angeles Times and, with absolutely no history or training in education, became the superintendent of LAUSD. The Times published a manifesto in 2016 on the effort to privatize public education by multi-billionaire Eli Broad. Beutner is continuing with this plan while banking a hefty $350,000 annual salary. The United Teachers of Los Angeles (UTLA) union is in the mediation process with LAUSD and Beutner was among those pushing back. Beutner stalled the negotiation process by taking over 56 days to begin negotiations - which is illegal. After 18 months of negotiations, UTLA and LAUSD have reached an impasse and are now in a fact-finding stage. If no agreement is met, UTLA plans on escalating with a strike. More than 93% of the voters voted in favor of striking. This demonstration of commitment to strike as leverage is one that the community group Centro CSO fully supports. Many local actions are planned for UTLA, including one in Boyle Heights in conjunction with Centro CSO. The event is a rally in support of UTLA's demands which include: smaller class sizes, more libraries, psychologists and nurses, just wages, a stop to cuts on PE, arts, sciences, music, and a stop to privatization efforts. The protest is on October 25 at 4 p.m. at Mariachi Plaza. Plans are to march from Mariachi Plaza to Boyle Heights Los Angeles Council District 14 José Huizar’s office. For more info call 323-943-2030, email [email protected] or check Facebook.com/CentroCSO.